After the brutal caresses of Antichrist (2009), Lars Von Trier returns to our screens to beguile us with Melancholia - a beautiful film about the end of the world. Operatically divided into a prologue and two Parts, and boasting openly apocalyptic subject matter, one might expect a grand narrative and plenty of spectacle. This is not what the film offers, however. A blend of semi-improvised dialogue, documentary-like camerawork, and heavily stylized imagery, Melancholia is a chamber piece about universal annihilation. The result is a film which will linger somewhere in the back of your mind for a long time. The film opens with a prelude of hauntingly nightmarish imagery, passing in extreme slow-motion to the sound of Wagner’s Tristan. This vision unsettles before the film’s narrative has even begun, casting even seemingly benign subsequent events into an uncomfortable light. The main body of the film centres around two sisters, Justine and Claire (Kirsten Dunst and Charlotte Gainsbourg). The first half concentrates on a wedding reception for Justine and Michael (Alexander Skarsgård), during which Justine’s depression starts to manifest itself. Personal and work-related anxieties simmer beneath the veneer of familial bonhomie. Von Trier’s handling of the wedding is a perfect blend of humour and drama, and he is aided by a fine ensemble cast: Kiefer Sutherland, Alexander and Stellan Skarsgård, John Hurt, Charlotte Rampling, Udo Kier. His actors offer a series of memorable character portraits - the numerous family and business tensions play out with expert precision (all the more remarkable given how much of the dialogue was reportedly improvised). The scenario of this first half could be a film in itself, but soon an added element begins to take the drama in another direction. The guests walk out into an empty, eerily-illuminated golf-course. Celebratory Chinese lanterns are lit and rise into the darkness. Far above, there glimmers a star that seems to shine brighter, before vanishing. Some unspoken threat mingles with the guests and hovers in the night sky. The film’s second half follows the course of Justine’s deep depression whilst staying with her sister. Her visit coincides with the approach of Melancholia - a huge planet that has been knocked off its orbit and is on a near-collision course with the Earth. Claire’s husband (Sutherland) and son (Cameron Spurr) eagerly await the fly-past of Melancholia through their telescope, convinced the planet will miss Earth entirely. Despite her husband’s reassurances, Claire herself grows increasingly anxious. As the planet looms ever larger in the sky, the film shifts into a psychological exploration of the two sisters’ reaction to the approaching apocalypse. The surreal, serene vastness of Melancholia in the sky makes every detail stand out in strange relief. As extinction seems to beckon, the film takes on an unsettlingly quiet anticipation of disaster. Just as the four central characters are alone in the middle of their huge mansion and empty estate, so I watched the film in a cavernous and almost empty theatre. 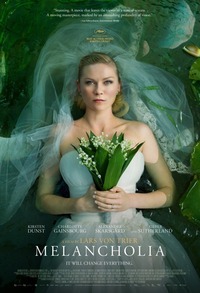 I found Melancholia’s strange mixture of microscopic and telescopic scale, of reality and illusion, peculiarly effective. Its contrast between Wagnerian romanticism and the quiet intimacy of a small cast produces a fascinating filmic world, which I urge you to experience in the cinema. This review was published on October 12, 2011.